The successive waves of Russian emigrants who have come to Australia over the past 124 years have almost all been drawn to our shores by the same reasons: wars, lack of arable land, changes in socio-economic and political structures. Queensland’s vast territory and relatively small population made it an attractive prospect, a land of opportunity for starting a new life, working their own land free of the restraint that existed in the Old World. Most Russians who came tended to seek naturalization as soon as possible. The success of the various waves of Russian emigration may be judged by the fact that there are now some 9000 – 10000 people of Russian descent living in Queensland, many of whose careers have contributed both professionally and culturally to the development of this state. The earliest mention of Russian settlers in Queensland dates from 1886 when the Legislative Assembly reported the presence of 67 men and 12 women of Russian origin living in the colony. Virtually no information has survived about these settlers except that they included miners, surveyors, carpenters and agricultural labourers. By 1891 this number had increased to 235. Census records indicate that these 207 men and 28 women tended to settle permanently on the land in rural areas, often marrying into local families and anglicising their names. The majority of these Russian emigrants would have come here via England, most probably encouraged by contacts with Agents–General in London who, on behalf of the State, were offering subsidised fares to prospective European settlers, with no restrictions as to where they wished to live or work. The reason for their emigration was largely economic. The lack of sufficient arable land, which had long plagued the Russian Empire, became particularly acute with the emancipation of the serfs in 1861. Brisbane became the main destination for a new wave of emigrants from the Far East following Russia’s defeat in the Russo-Japanese war of 1905. Soldiers and civilians, followers of minority faiths such as Baptists, Jews and Old Believers, began to leave Russian territories that had been ceded to the Japanese. The main route was through Shanghai, Dalny and particularly, Harbin, an important Russian city within China. Transport to Australia was usually by Japanese freighter and the heavily subsidized fares (only GBP8/10/-) encouraged many to set out across the Pacific. The composition of this new wave, however, comprised family units, rather than single men. By 1911 there were 581 men and 214 women, making the Russian community the fourth largest ethnic group in QLD with its own Honorary Vice Consul, a Mr. B.W. Macdonald. More than two-thirds of the Russians took up farms in the Darling Downs, Herberton, Maranoa, Maryborough and Rockhampton regions. Settlements were established at Ambrose Siding and Yarwun, where many Old Believers engaged in share-farming. Those who elected to stay in the city tended to live in South Brisbane, an area that has remained a focal point of the Russian community throughout the emigrations. The years 1911 – 1914 saw numbers of Russians arrive as political refugees with strong anti-Tsarist views. The majority of them tended to be urban dwellers, working in factories, railways, shops, at meatworks or on the waterfront. After the Revolution in 1917, some of the more radical of these new arrivals returned to their homeland. The revolution in Russia caused the Australian Government to declare an embargo on Russian emigrants from 1917 – 1922. During this period many Russian nationals, mainly members of various White Armies, Monarchists, Cossacks and their families had retreated across Siberia and thence to China, where they lived in very straitened circumstances. Their only hope was to emigrate again. Lifting the embargo in 1922 gave rise to the largest influx of Russians into Queensland so far. From 1923 onwards a steady stream of Russians flowed into the State – their population increasing to approximately 3000 by the late 1930s. Although South Brisbane remained an important centre for incoming Russians, work was scarce in the city – the depression years were beginning. Rural areas, however, did offer opportunities. In 1923 the Callide Valley had been surveyed and divided into blocks of 200 or more acres, which the Land’s Office was offering for 5, 10 or 15 pounds per allotment, depending on its size. Russian emigrants eagerly applied and, by painstakingly clearing brigalow and prickly pear by axe, and sowing crops by hand, they were instrumental in opening up much of the land in Theodore, Thangool, Biloela, Mt Larcom, Callide and Monto. They became small crop farmers, engaged in dairying and growing cotton. The Russian families built their own clubhouse and also had their own football team to compete in the local matches held in the Valley. One of the cotton farmers in Biloela was Ataman (Chieftan) General Vladimir Tolstoff, commander of the 4th Ural Cossack regiment during the Revolution. At the end of 1919, with his troops being decimated by the superior number of the Bolshevik forces, unable to obtain any arms or supplies, but unwilling to surrender, General Tolstoff decided to lead the remnants of his regiment South to Persia – a gruelling journey by camel and horseback through Kazakhstan and Turkmenistan during which many perished from the cold as well as cholera and typhoid. The reason for choosing this destination, according to his grandson, Michael Tolstoff, was that as a cadet in the St Petersburg cavalry institute, one of the General’s closest friends was the Shah of Persia’s son. The Shah warmly received the 162 cossacks that eventually arrived and after they had recovered from their journey helped the group to travel further to Vladivostok and then China. There, all who found work pooled their money into a communal kitty, which was eventually sent to Brisbane where a farming property in Thornlands was bought in the regiment’s name. Thus, in November 1923, 57 Ural cossacks, men, women and children, sailed into the Port of Brisbane where upon the men, dressed in cossack uniforms formed ranks, and carrying their regimental standards, marched on foot to their land awaiting them. Other Russians, unable to take up farming, left their families in Brisbane and supported them by picking cotton from April to August then cutting sugar cane until December from Bundaberg to Innisfail. The mines at Mt. Isa, Mt. Mulligan and Mt. Morgan were another source of employment. The Sergeev brothers, Vassily, a geologist and Alexei, worked in goldfields, mined nickel in Clermont and during their prospecting days invented the dry sluice, still in use today for extracting gold and gemstones where there is no water available. Vassily, referred to as “Bill”, features several times in Ion Idriess’ book “Opals and Sapphires”, whilst Alexei is still known in mining circles in Clermont as the inventor of the dry blower or the “Russian Puff Puff” as one mining journal called it. Closer to Brisbane, Russians settled on small farms in Ormiston, Runcorn, Rochedale and Cleveland growing vegetables, flowers, strawberries and pineapples. The descendants of some of them are still farming these today. In the city itself, Mr. Vassily Morjanoff had a bakery, while some of the first continental sausages were made by Rudi Koplick. Bill Slusar (Vladimir Slyusarenko), an aeronautical engineer had his own motor workshop and garage. Assisted by another engineer, George Baronoff, and former pilot-navigator Alexander Shevtzoff, he built and flew his own plane named “Miss Sandgate”. In Russia he had worked with Igor Sikorsky of the helicopter fame. Anton Katts served in the Russian imperial army and was a member of the Tsar’s Military Balalaika Orchestra before emigrating to Australia. Always interested in metalwork, as a hobby he became an accomplished sheet-metal worker restoring metal objects and creating others out of copper, especially his ornate jardinières. This talent led to his unique contribution to the history of this city when he was commissioned to make the hands for the Brisbane City Hall clock. Completed in 1929, the hands are still on the four clock faces in the City Hall tower, today. Many women emigrants of this era were skilled in needlework and earned their living in this way. Mrs. Zavernyaev had an embroidery factory while the gowns, appliqués, cushions and artificial flowers made by the mesdames Petersen, Barr and Vereschagin found a ready market in the city stores. Beautiful quilts of elaborate designs made by Mrs. Maria Petroff, convent trained in Russia, were highly prized in the community. Zinaida Pavlovna Smikoff, who fled the revolution with her white army officer husband and small son, had graduated from a prestigious Lycee and Pedagogical Diplomatic Institute in St Petersburg speaking 7 languages with a gold medal in French. Upon migrating to Australia, she needed to learn another language, English, in order to support her family, and managed to find work as a cleaner in the Brisbane Girls Grammar School. One day whilst tidying the headmistress’s office, the headmistress walked in, loudly voicing indignation about something in French. Unable to resist, Mrs. Smikoff laughingly chided her for her outburst in perfect French. The astonished headmistress (Miss Lilley) asked her Russian cleaner to sit down and tell her how she came to be so fluent in French. Soon afterwards, she appointed Mrs Smikoff as a teacher of French at all levels at the school where she taught for 25 years, greatly respected by all the girls who knew her as “Madame”. Some, however, had to go further afield to find employment and not a few pastoral families were introduced to Russian cuisine by the young women who became cooks on sheep and cattle properties. From the mid-thirties, many of the farming families began returning to Brisbane, principally to give their children the educational opportunities they themselves had missed. The main secondary schools were then in Brisbane. Queensland Russians began to establish their own businesses, with cabinet making a favoured occupation. George Brothers, Service Industries, Woodcraft, Dneprovsky’s and Boukasseff’s were Russian concerns that provided employment for fellow emigrants and local Australians. The first caravans to be built in the State came from the factory of Konstantin Potanin. Many people of my generation will remember Basil’s coffee shop and the Princess Restaurant run by Mr. and Mrs. Vassily (Basil, in English) Naggih. Brisbane later had another Russian restaurant “Czars” owned by Tamara and Vladimir Loscutoff. In heavier industries, the innovations and technology of Russian engineers have earned considerable renown, especially in post-World War II years. A process developed by Michael Rudnev utilising aluminium and polyurethane, enabled him to build the first commercial cool-rooms in Australia. Heavy machinery designed and constructed by Nicholas Manoiloff of Hilleng Pty. Ltd. finds markets in China and elsewhere abroad. Chemical engineer Alexander Saranin is well-known in the Queensland Sugar Industry where he worked for 35 years. His inventions have led to numerous patented technical processes and equipment, earning him the Federal Gertrude Kumm Award for Outstanding Citizenship, stating that: “his scholarship and research was a significant contribution to the advancement and prosperity of an industry vital to Queensland and the nation”. The end of the Second World War saw the arrival of the largest number of Russian immigrants to date, almost doubling the Russian population here. There were two main streams – those from war-torn Europe the others from China where the new regime had decreed that foreigners depart from Chinese territories. 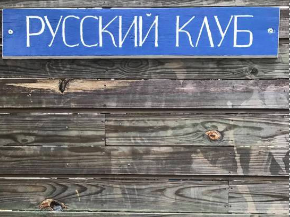 Although the vast majority of these new immigrants had arrived by the mid-50s, the past four decades have seen the arrival of what may be termed the last wave – this time, from the former Soviet Union and Russia. Cultural and social activities have always been an integral part of the Russian community and the focal point of these activities has traditionally been the Church. This is especially so for emigrants, because for them, the Church not only ministers to the spiritual needs, but is also a place to meet fellow countrymen, new arrivals, learn where work or accommodation may be found, what functions were being planned. Although in the 1920s Brisbane Russians already had a small club, today known as the Russian Club in Trafalgar St., where they met to play chess, cards, even stage the occasional play, there was no priest in the community until 1923, when Archpriest Alexander Shabasheff arrived in Brisbane. There was of course no church, and the congregation was small, so services and other religious rites were conducted in parishioners’ homes at first. But, with the arrival of more emigrants, the need for a church became imperative and, in 1925, under the auspices of Canon D.J. Garland, Father Alexander was given permission to hold services at St. Thomas’ Anglican Church in Grey St. and to form the first Russian Orthodox Parish. The tiny community of some 30 families began to collect funds for a church of their own and by 1926, had sufficient money to buy an allotment in Vulture St, South Brisbane, with a cottage on it, which they converted into a church. By 1933, however, the congregation had outgrown these premises, and led by the then Rector, Archpriest Valentin Antonieff, the parishioners decided to build a new church in authentic Russian Orthodox style. Intense fundraising activities ensued by Russians, both in Brisbane and in country areas. Those unable to contribute financially gave freely of their labour. Detailed plans were drawn up by Grigorii Mekhonoshin and handed over to Australian architects, Kavanaugh and Kavanaugh, and a builder, Mr. Robinson, since only Australian companies were permitted to construct public buildings at the time. But since Australian builders had never seen, much less ever built the distinctive diamond-scaled cupolas, they were constructed and fitted onto the roof an 80-year old Russian engineer, Titus Golovisinin, assisted by a young metalworker, T. Goubareff. The interior of the church was done mainly by Russians: the iconostasis, designed by G. Mekhonoshin, was constructed by V.E. Morjanoff and the iconography on it painted by V.P. Bobroff and B.E. Murarenko. The Royal Gates in the iconostasis were ornately carved and completed by Anton Khrutsky. The widow of Father Adrian Tourchinsky donated priceless rare icons and the beautiful chandelier that hangs in the church. With the insertion in the belltower of a stained glass window depicting the Maltese Cross of Queensland, the first traditional Russian Orthodox Church to be built in Australia was completed in 1936. Upon the appointment of Australia’s first Russian Bishop, Bishop Theodore, in 1948, St Nicholas’ was designated a cathedral and is now a heritage-listed building. The old church building was converted into a library and a church school, the library being founded on books brought to Australia by emigrants and donated to the church. One of the largest donations came from the personal library of Father Adrian Tourchinsky (1883-1928). Today, the library boasts over 13,000 volumes, including many valuable editions now out of print. There are now four Russian Orthodox churches in Brisbane: Saint Nicholas’, Saint Seraphim’s in Hawthorne Road, the Orthodox Church of the Holy Annunciation in Park Road, and the church of the Blessed Virgin of Vladimir in Rocklea next to the Russian Benevolent Home. Services are conducted in English at Park Rd and partially in English at Saint Nicholas’. Just recently a new parish has been formed at the Gold Coast in the name of Saints Cyril and Methodius. Although a Russian School had existed sporadically from 1919, it was not until 1927 that an effective Church School was established. Parents in the community were anxious that their children know and understand the cultural heritage of their forbearers, consequently the curriculum was based on religious instruction, history, literature and language – as it is today. Two main Church Schools operate at present in Brisbane at St. Nicholas’ and St. Seraphim’s, one day a week, taking children from kindergarten to grade 12. Since there is no secondary school in Brisbane teaching Russian, the schools have at times accepted pupils of Russian and non-Russian origins wishing to study Russian to matriculation level. Once the church was built, the next community project was to acquire a Russian hall. Balls, concerts and amateur dramatics were an effective way of providing both entertainment and opportunity to raise funds. One of the first artists to give a benefit concert for the community was the Russian ballerina, Anna Pavlova, during her tour of Australia. There was no lack of talent among the emigrants, and the skits and musical comedies and plays ranging from Chekhov to a Russian version of ‘Charley’s Aunt’ were held in hired halls. Russian operas by Tchaikovsky, Glinka and Borodin were performed under the artistic direction of the Troitsky and Buk families, known throughout the community for their musical professionalism and expertise. At balls and social gatherings, music was provided by a Russian string orchestra of balalaikas, mandolins and guitars, led by Nikolai Kosareff, who even made his own balalaikas. This tradition is carried on today by the Tolstoff ensemble of balalaikas and accordion. In 1956 the Russian community finally had enough funds to buy their own hall in Lotus St., Buranda. Enlarged considerably in 1973, and with the addition of a large kitchen and cold room, it is now called the Queensland Russian Community Centre. A venue for all Russian cultural events, it hosts performances by our popular Russian Folk Choir, “Samosvety” (Gemstones) led by Alla Ekzarkho and the “Ensemble of Russian Song” directed by Natalia Alexandrovna Semeneeva, the “Dance Group of the Russian Centre” (Maximo Studio) under the tutelage of Olga Shikina, the “Kalinka Dance Group” and the “Kossachok Duo”. They combine the talents of older generations, some already born here, with the expertise and skills of the last wave of emigrants, for the teachers, conductors and directors of these groups are now mainly from the former Soviet Union and Russia. Russian has been taught at the University of Queensland since 1963 and, from 1965 onwards, upon the appointment of professor Boris Christa, grew to be the largest Russian department in Australia. Sadly however, because of dwindling numbers, the administration in 1997 was proposing to abolish the teaching of Russian. In order to avert this disaster and show the University the Russian department had the full and real support from the Russian community, a true meeting of town and gown occurred. All Russian organisations, the clergy, notable professionals, concerned parents, joined with the teaching staff, past and present lecturers and students, to appeal to the University. Members of the Russian Department and active members of the Russian community formed the Pushkin Foundation and organised a very successful ball, gathering sufficient funds to endow a scholarship enabling a student of Russian to go to Russia during the long summer vacation and attend an intensive language course. This convinced the Administration to retain Russian at the university and the Foundation has continued to award this scholarship ever since. People of Russian origin have also contributed in the sphere of classical music. In the mid-90s, world renowned concert pianist, Lev Vlassenko was appointed visiting professor and international consultant to the keyboard department at the Queensland conservatorium with the aim of introducing the Russian school of piano playing. His daughter, Natasha Vlassenko, is now Head of the Keyboard Department of the conservatorium, and together with her husband, Oleg Stepanov, continues this tradition. In 1999 they founded the first Lev Vlassenko Competition in Brisbane. This competition, held every two years, gives talented young Australian pianists the opportunity to perform on a concert stage and is the largest national piano competition in Australia. The creative work of gifted Russian artists have also helped promote cultural understanding and development. Evocative miniatures depicting Russian landscapes by Miron Petroff grace many homes in QLD. The talents of Arsene Martin (Savitsky) as a portraitist and a specialist in the ancient art of icon painting have earned him commissions from all over Australia. Illustrations from Russian folklore, seascapes and still life paintings by Rima Karp are well-known in Brisbane, whilst the sculptures of George Virine appear in Australia and abroad. In the literary area there are two important Russian magazines published quarterly in Brisbane which provide a forum for writers, poets, reminiscences, historical and classical literature as well as social and family themes. “Zhemchuzhina” (the Pearl) is published by Tamara Maleevskaya and “Australian Lampada” (Icon Lamp) by Lyudmila Larkina. One of the community’s proudest achievements is its building in 1969 of a Benevolent Home for the Aged at Rocklea. This home, which offers a haven for elderly people of all denominations, was made possible by the dedicated efforts of almost every Russian in Queensland. In 1988, in order to mark the millennium of Russian Orthodoxy, as well as the Australian bicentenary, the Russian community held a grand ball with the intentions of commissioning and presenting the city of Brisbane with a bronze statue of Saint Vladimir (founder of Russian Christianity in 988). It now stands in the grounds of the University of Queensland, by the river. This was done not only to commemorate both historical occasions, but also as a gesture of gratitude to the State and its people for offering hope and a new life to all Russian emigrants who have come here over so many years. Many thanks to Dr Maria Kravchenko!